rec. Chapel of Merton College, Oxford. Date(s) not specified. Performing edition of Missa di dadi by Timothy Symons available in pdf format from Gimell webpage, where a promotional video and free sample track are also available. Reviewed as 24-bit download from hyperion-records.co.uk. Also available in mp3 and 16-bit lossless flac and alac and in same formats plus 5.1 wma or flac surround and on CD from gimmel.com. All come with booklet. In his review of this recording, John Quinn found himself at a loss for words: between us we seem to have used up all the superlatives in earlier reviews of The Tallis Scholars, live and on record. As I’m following up his review, I’m even more at a loss for words to express my appreciation of this latest recording. It’s a worthy Recording of the Month and it bids fair to become one of my Recordings of the Year, following in the footsteps of one of my choices for 2015: John Taverner Missa Corona Spinea and other works (CDGIM046). Last year Taverner; this year The Tallis Scholars return to the wonderful series which they have made of Josquin’s masses. I’ve followed the series avidly and been highly impressed by them all. The earliest recordings in the series are offered as a 2-for-1 set, The Tallis Scholars sing Josquin, containing the Missa pange lingua, Missa La sol fa re mi and his two Masses based on the L’homme armé theme. That superb value set, containing his best-known Masses, is the place to start even if you have recordings of some of them – and there are no current rivals for Missa La sol fa re mi. (CDGIM206 – review – Tallis Scholars at 30). - The Medieval Ensemble of London/Peter and Timothy Davies with Missa faysant regretz – rec. 1984: Decca Oiseau-Lyre 4119372 or 4759112 [51:44] both available only as Presto CD (follow link) or download. Download Roundup November 2011/1. The Decca recording retains a distinguished place in the catalogue and though the new Gimell supersedes it in some respects it is still very much worth having. Though the Oehms recording is well performed, with boys’ voices which many will prefer, I rule it out of the running for the annoying way in which it breaks up the sections of Missa di dadi with other music. Of course the sections of the Mass were not performed consecutively in liturgical celebrations, but they were certainly not preceded by sections of two masses by Isaac or interspersed with other music, some of it secular in nature. If we needed a secular interpolation, why not Robert Morton’s song N’aray je jamais mieulx, which forms the cantus firmus of Missa di dadi? Incidentally, it would have been helpful if Gimell had included the song – there would just have been space. Where the new Gimell recording of Missa di dadi scores over the Decca is in its use of a new edition by Timothy Symons, generously made available to all comers in pdf format on the Gimell webpage, where a promotional video is also available. The Scholars are more measured than the performers on either of the other recordings. In some cases that may well be due to the use of a better edition, as in the case of the Sanctus and Benedictus where the text of the older recording met with some reservations, but it is typical of the Scholars that they usually give the music a little more time to breathe than other groups and that is almost always to the benefit of the music. There are no other recordings of the coupling; indeed, I hadn’t even heard of the Missa une mousse de Biscaye. Like Missa di dadi it’s based on a secular tune: the mousse of the title is a dialect term for a girl, in this case one who appears to speak only Basque and replies to all question with a mystifying answer. The Basque language, not related to any other European tongue, is synonymous in French with incomprehensibility: the expression parler comme une vache espagnole, is a corruption of une Basque espagnole. 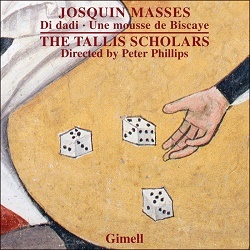 Though both Missa di dadi and Missa une mousse are probably early works – their attribution to Josquin has even been questioned – I very much enjoyed hearing this recording. John Quinn has given details of the differences between the two, which I don’t need to repeat. The 24-bit sound is excellent: in addition to the 24/96 version to which I listened, available from both Gimell and Hyperion, there’s also a surround-sound version from Gimell which audiophiles will want. None of the formats are expensive: they start at £6.99 for mp3 up to a still reasonable £17.99 for 24/176.4 or 24/96 surround sound. Peter Phillips’ notes in the booklet, as usual, are very informative; like all good scholars he neither talks down to the reader nor uses technical terms above our heads. He gives us the information that we need about the connection of Missa di dadi with the game of dice but leaves us to draw our own conclusions. The generous availability of the new edition of the score of Missa di Dadi is an additional recommendation. All in all this is a very worthy successor to earlier Tallis Scholars offerings. Try the free sample track or watch the video at your peril – either will tempt you to buy the recording.